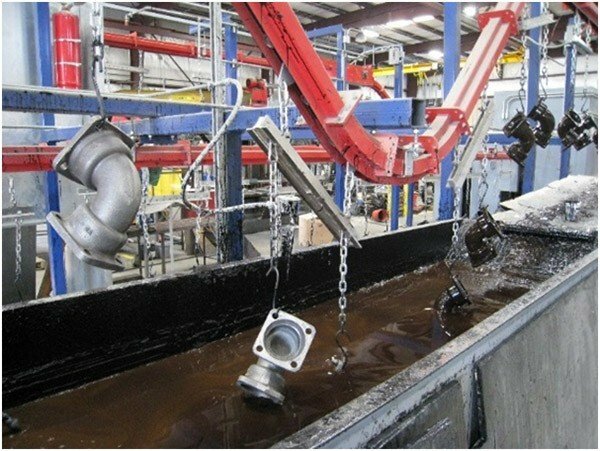 When we refer to dip line finishing processes this can include everything from the pre-wash, chemical pre-treatment, and cleaning processes involved in preparing an item for painting to the electrophoretic coatings and wet paint applications of final paint finishing. 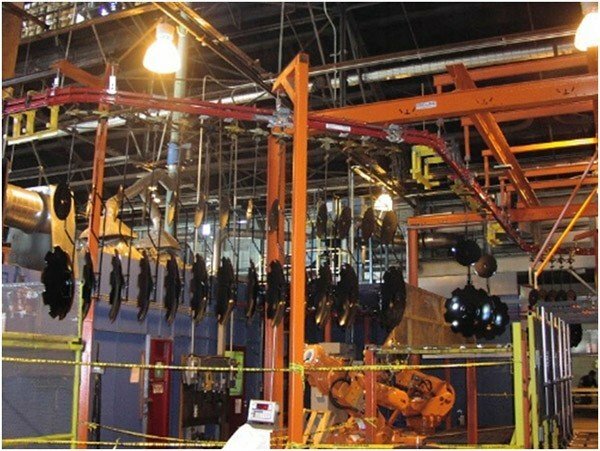 An overhead conveyor is an excellent material handling option for automated dip lines as it allows you to hang parts and easily immerse them in and out of dip tanks. Having the parts hang below the conveyor also ensures that the track and chain remain free of paint and contaminants. In addition, all dip line processes will involve a drying stage. 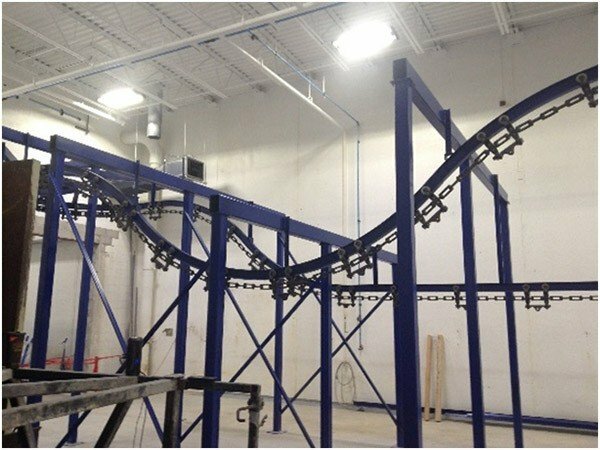 A single loop overhead conveyor system can be designed to transfer parts from the dip tank to an oven at this stage or for some products, the system may be designed to move parts up and over other equipment to efficiently utilize the warmer ceiling area to buffer parts while drying. PACLINE conveyors have been used to transport a wide variety of items through virtually all types of dip line processes. The conveyor of choice for dip line finishing will depend partly upon the size and weight of the item being finished but also on the complexity of the processes involved. For example, is accumulation or buffering involved in the process? Will the parts be transported through several different dip processes before or after painting such as chemical washes and curing ovens? How much space is available for the conveyor system? What is the size of the dip tanks that the conveyor must accommodate? Small metal parts conveyed through a wet paint dip line. This compact conveyor makes efficient use of space from the dip tank to the ceiling area for drying. This power and free conveyor system allows parts on the same line to stop or accumulate as needed while other parts continue through the dip line finishing process. The enclosed track PAC-MAX™ can carry very heavy parts and also handle steep inclines and tight curves for efficient use of space. 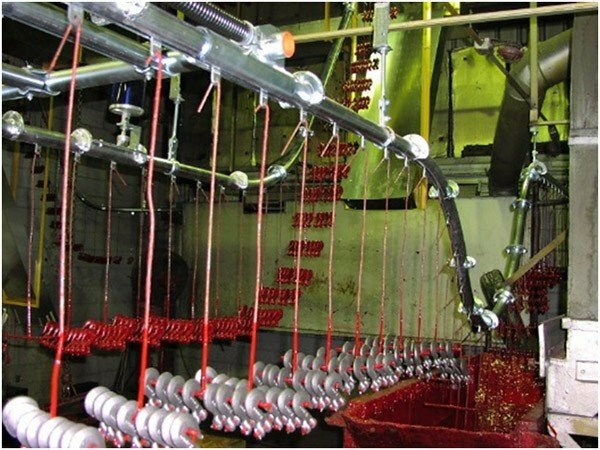 With heavy duty forged chain and trolleys, the PAC-BEAM™ conveyor is a cost effective option for many dip line finishing systems.